From the YEA! 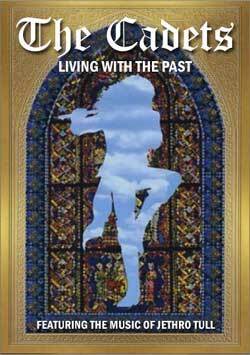 Web site: Taking a new turn in a new direction, the Cadets announced yesterday that for the summer of 2004, the corps will be presenting a visual and audio program titled "Living With the Past." Featuring the music of Jethro Tull, the program will explore a wide, wide variety of musical styles. Classical, jazz and for sure rock will form a basis for an exploration of sights and sounds not encountered in recent years. Marc Sylvester, the architect of the program, said, "We have a long way to go in terms of developing this idea but, as of today, we certainly have enough to move forward. We have listened to every CD, we have discussed the visual treatment, and we have even started sketches or costumes. We are at a place where we know where we are going. "^George Hopkins, the director of the Cadets, noted, "At some level, what is intriguing about the show is the musical possibility. Having the chance to show the world that it is not necessary to play the latest concert band selection to be successful is exciting in its own right. Play Metheny, play Beethoven, or play Tull, just make it exciting, play well, and the world will love you." Tom Aungst, Don Hill, Marc Sylvester, Jeff Sacktig and Hopkins have been in conversations through the band season, but only now are the ideas being put to paper. This weekend at the YEA! audition camp, discussions will be conducted from late at night until early in the morning. Come Thanksgiving, the arrangements will begin to come to life and on Dec. 12, the 2004 Cadets will begin to rehearse this new, exciting, and somewhat unconventional program. The program is not about Jethro Tull. Rather, the presentation utilizes the group's music as the base for the exploration. Early concepts rotate around the look of the minstrel, a juxtaposition of musical styles, the differences and similarities of men and women, and much more. Visual composition, visual integration, and a high level of coordination will be the hallmarks of this ground-breaking program. Wondering what tunes to listen to? "Aqualung," "Living in the Past," "Thick as a Brick," "Bouree,"
"Locomotive Breath," "Songs from the Wood," "Mother Goose" and "Cross-Eyed Mary." At the December 12-14 camp of the Cadets, the plan is for about two minutes of music to be performed. From there, the corps is "off to the races/" Listen for excerpts right online at YEA.org.